Some of the rescued dogs at Noah’s Ark. Dimapur, Nov. 10: As a young girl, Imlisenla Pongen would always bring home lost dogs or puppies and kittens, and nurse them in her room. This love affair with homeless animals never faded; and her mind was made up on opening an animal shelter one day. Fast-forward some few years and you have Noah’s Ark—a mini animal shelter and adoption centre that she started at her home in Dimapur, from where she plans to help find temporary or permanent homes for the animals. “I’m still studying, so it’s a challenge both financially and physically to invest on a full-time permanent shelter as of now,” she told Eastern Mirror. A graduate in environmental science, and very much of the digital age, Pongen came up with the idea of involving the online community through Instagram as well. “I hope the online community brings like-minded people together where anyone can volunteer to shelter the homeless animals,” said the administrator of Instagram page noah’s.ark.nagaland. Even as events like the dog meat festival in China have created uproar amongst animal activists around the world, she was asked about the similar practice of consuming dog meat here in Nagaland. “They had to do whatever they could to get by, for example: just the fact that something as simple as salt was a highly sought after commodity (in the olden times),” Pongen said. Currently pursuing a course in Tourism and Hospitality Management from ICFAI University in Dimapur, Imlisen beamed at how her parents were supportive of her venture even though they had concerns initially. “It’s a challenge and a big responsibility but I’m happy that my parents are supportive and with the little contribution that I’m able to give through the online community, I hope to one day open a bigger shelter with a bigger team,” she shared. According to her even though the kittens she took in needs constant attention, most of the animals get adopted instantly so the issue of food and space is not much of a problem. Ideally, she hoped, there should not be any “excuse” preventing the adoption of lost animals. “This is primarily the reason we want to build a community, so that the load of responsibilities are shared. It also comes along with a bit of sacrifice—which, every genuine animal lover knows, is totally worth it. If the rest of the world can do it, we can too,” she said. 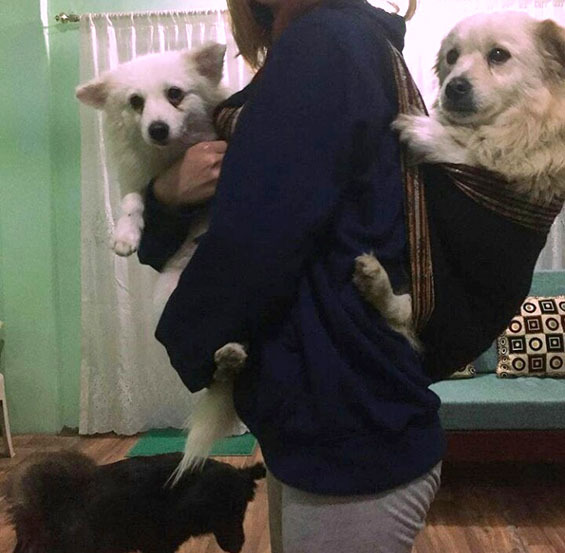 The dotting “single mother”, as she calls herself in reference to her caring for puppies and kittens, hopes that the initiative garners enough momentum; that the active participation of the community will keep itself moving and be a push towards the start of a good cause for animals in the state. Noah’s Ark currently has five cats and four dogs; and she has already given away six animals for adoption to loving homes.